Over the years I have built many flow through live wells. Typically if you own a boat that has a factory live well, it will be a recirculating live well. While a recirculating live well works fine to keep shrimp or a few small bait fish alive, it will not do so good when a live well full of frisky baits is needed. A flow through live well pumps water in to the well and a gravity fed overflow that will allow the overflow to drain from the live well. When you use a bait such as whitebait or any other schooling fish, a flow through live well is a must. Whitebait have a very high metabolism, which requires lots a oxygen and they produce lots waste proteins. If the proteins are not removed from the live well, the bait will die. The protein comes in the form of white to off white bubbles. When the bubbles start to stack up it’s on only a matter of minutes before all the bait is dead and all the hard work and time involved is wasted. The first thing to decide is the location of the well. The best place for a live well is the back center of the boat, but I have seen them in the front, back, middle and sides. You can have it below deck or above deck. The above deck live well is easier to install and use. With a below deck live well, it’s seems like you are having to stand on your head to get a bait, but does not reduce deck space and offers a much cleaner look. How big? The wells are measured in gallons, since the water is replaced every few minutes you can get away with a much smaller live well that will support more bait. But I like to build the live well as big as the designated location will handle, as long as the weight does not become an issue. Remember water weighs about 8 lbs per gallon, so a 10 gallon well will add 80+ lbs. There are many choices for the container. Many companies make live wells in many shapes and sizes and most very high quality. But there are many options at a much lower cost. A low cost alternative to buying a live well is to use a cooler. The best shape for a live well is round, followed by oval, then rectangle with rounded corners. The container must be able to support the weight of the water and withstand the elements. It is also better to have lower profile container to help keep the center of gravity as low as possible to reduce the splashing and spill over. There will be at least two intakes pipes; a high speed pick up and a pump pick up. The high speed pick up is basically a 45 degree angle cut on the end of a pipe that is slightly below the surface of the water, when the boat is on a plane. 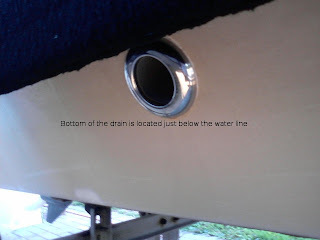 The pump pick up is a pump mounted below the water line when the boat is at rest and above the water line when on plane. Each intake will need it’s own pluming, if you run the high speed pick up through the pump it will reduce the life of the pump. There is one drain, which must exceed the capacity of the intake. To make sure this is always the case, I used 1/2 intake pipes and 2 1/2 drain. The water level will be controlled by the location of the drain and not the drain capacity. The drain also needs to have a filter so the bait does not get pushed out the drain. The inflow also needs a filter to avoid pulling in sea weed and other debris in to the inflow pipes. 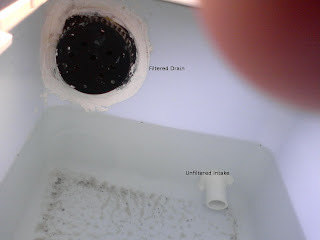 The drain needs to be located near the top and the inflow needs to be located at the bottom. For any shape other than round the drain and inflow will be on the same wall but, opposite sides. What this will do is help the water circulate in a circular flow. If the inflow is in the center it will cause the water flow to act like a washing machine and that is bad for the bait. 1 – Gun size 5200 marine adhesive. 1/2 inch PVC connectors or couplings. Since the procedure is about the same regardless to the container type, I used a 12 gallon (48 qt) cooler I picked up at Wal-Mart for $15.00. The first step is to layout everything and have all the measurements before you make any cuts. Then start making all the holes for the hatch, drains and mounting the intake pipes and drain bulk heads. When drilling holes in a cooler, use very light pressure, the plastic shells have a tendency to split. If that should happen, you should start over with a new cooler to avoid any leaks around the seals. This design has two intakes, one pump and one high speed. Notice the flex tubing, this is any important part of the system. Since boats bang around most of the time, there is going to be a lot of stress put on the joints of the pipes. I use flex pipes close to any angles in the pipe. This will allow some flexibility in the pipe structure. Since the check valve will reduce the water flow, I installed only one check valve on the high speed intake. You will also need a siphon break, when the boat changes planes (on plane or off plane) the intake source will change. i.e. When the boat comes off a plan the high speed intake stops and the pump intake will take over. This is where a siphon can set up in the high speed intake. This means the water flow will reverse and flow out the high speed intake, draining the live well. A siphon break is just a small hole 1/16 or 1/32 inch in the top of the intake pipe. This will serve two purposes. The first is to allow air into the top of the pipe when the inflow as stopped, breaking the siphon. The second is when the high speed pick up is working a small stream of water will shoot out of the small hole. This is a very simple and very effective way to monitor the high speed pick up. If the stream starts to slow down or stop, chances are there is some debris building up in the intake feed and you will need to stop and clear it. The siphon break applies the same way to the pump inflow. The two intakes should merge in to one pipe so there will only be on inflow pipe in to the live well. And the drain returning all the intake water back to ocean. The drain on the outside of the boat must be lower than the drain in the live well. Once you have the layout completely worked out you will need start with making the holes for the hatch(if below deck), drain and mounting the water pick ups. It’s best to have the pick ups and drain installed before you start. You can use the existing cooler top, but make sure it opens facing the back the back of the boat. You do not want the wind to catch the lid and rip it off. And if you use the cooler top you might want to find a cooler that has a small access door in the top to reduce spill overs when the live well is open. Or you can make a top out of cutting board material with a small access hatch in the center. To secure the live well to the deck you can drill 4 holes in the bottom of the live well and attached it using bolts through the top of deck. Make sure to use plenty of 5200 to seal the holes. You will want to use large washer and seal under the deck, between the top of the deck and live well and most important inside the live well. If you ended up with a leak it is very hard to fix without tearing it down and starting over. Securing the container under the deck is a challenge. Since I built the deck on my boat, I installed the live well before the deck was installed. If you do not have that option you will need to have access to area and be able to slide the container in place. 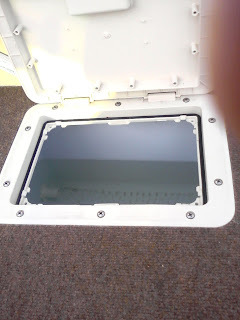 It’s best to cut the access hatch hole first (making sure you have the exact measurements!) . Next you will need to seal the top of the container to the deck. The easiest way to do this is to built a platform that allows 3/4 inch clearance at the top of the container and the deck, then slide the container in with plenty of 5200 on the rim to seal it. Then on each side, drive 1×4 (which is 3/4 inch think) PT deck lumber under the container which will press the container against the deck and sealing it to the deck. Then secure the container to the deck lumber, if the fit is rally snug you can use a thick bead of 5200 around the cooler and that should hold. Then secure deck lumber to the platform. Once you have the container secured, you can connect the pluming. There are several transom mount on the market. But they are very easy to build. Just cut a 45 degree angle in the end of a 1/2 PVC pipe. Mount the pipe so the top of the angle is just about even with the bottom of the bottom. I also used 4 strands of stainless steel wire attached with epoxy to keep out any grass. When the boat is on a plane it will force water into the pipe. This is a little more tricky. You want to mount the pump on a stainless L bracket, just above the bottom of the boat, so that is will not touch the water when you are on a plane, but will be below the water line when the boat is at off plane. If you have a small boat you will want the pump closer to the center line of the boat. In small boats if you mount the pump on the left or right side and your boat leans to one side, it cause the pump to start sucking air and form airlock. On larger boats you will not have this problem. If you can get an automatic bilge pump you can just leave the power on and when you jump up on plane the pump will automatically shut off and turn on when you come off plane. The way I build mine is not pretty, but it is easy to monitor the water flow and adjust or repair most of the pluming. Notice that the high speed pick up and pump pick up are connected using a pvc tee, forcing both intake pips in to a single pipe. At that single pipe then is run in to the live well. You can use a bulk head to connect the single inflow pipe in to the bottom of the live. I chose to use 2 pvc couplers and a small piece of pipe. I drilled the hole so the pcv pipe would have a snug fit then cemented the one coupler with the pipe and used 5200 to glue it in to place. Then cemented the other end. I also built in a spray bar that attaches to the inflow pipe to spray the water from the top of the live well. It’s not very usful, so I think just a single bulk head would be easier and faster. 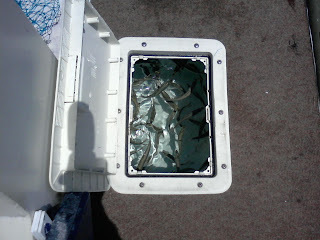 Last is the drain, I used a hole saw to drill the hole about 2 inches from the top of the cooler. Do not drill the hole too high or the cooler will crack and bust apart from the weight of the water. I installed the stainless bulk head and use plenty of 5200. Then attached a pool skimmer basket with a liberal amount of 5200 over the bulk head. This will keep any bait from going out the drain and it does not restrict the drain flow much. 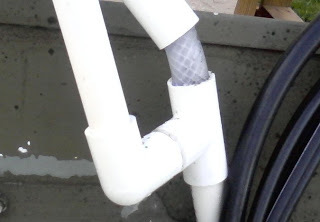 Then used a flex hose to connect the live drain to the outside drain. You will want the outside drain to be at or below the water line. If the drain is to high it will make lots of noise as the water runs out and it may reduce the drain capacity. But the most import issue with the outside drain is that it must be lower then the drain in side the live well. A 10-12 gallon live well will easily support 100 or more frisky whitebait. … been using a similar set-up for years – with great success. The difference being that we mostly use it with either a large bucket/garbage can or existing livewell. The feed line has been a 3/8″ or 1/2″ copper pipe with 90 degree angle that faces up-current under the boat. Put a ball valve on it to shut it off when not in use. The difference between your feed and mine is that I put my feed ABOVE the water – no siphon action – only 1 line. 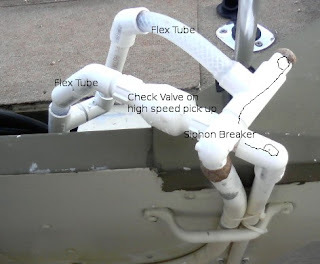 I don’t use a bilge pump for stationary water changes – a bucket works fine. The drain is essentially the same. We used to keep 15 inch atlantic mackerel and 12 inch pogies alive in the garbage cans. A 2-inch drain with some kind of screen if using small bait. the drain either went right over the side of the boat, or thru the hull but ABOVE the water line. The deal with the higher drain is that the livewell drain was higher than the waterline and to reduce potential for future leaks with a fitting under water. Now that I fish FL a lot in a 14 ft boat, I use a small (10-gallon) in-boat livewell with the copper feed line and a bubbler-type aerator. I will lose small pogies after 4-6 hours when sitting a lot BUT don’t lose shrimp, white bait (shad, herring, pilchards), or mullet. The bubbler itself will keep the shrimp and mullet all day without water changes – the white bait and pogies are a lot more tempermental, needing water changes often.